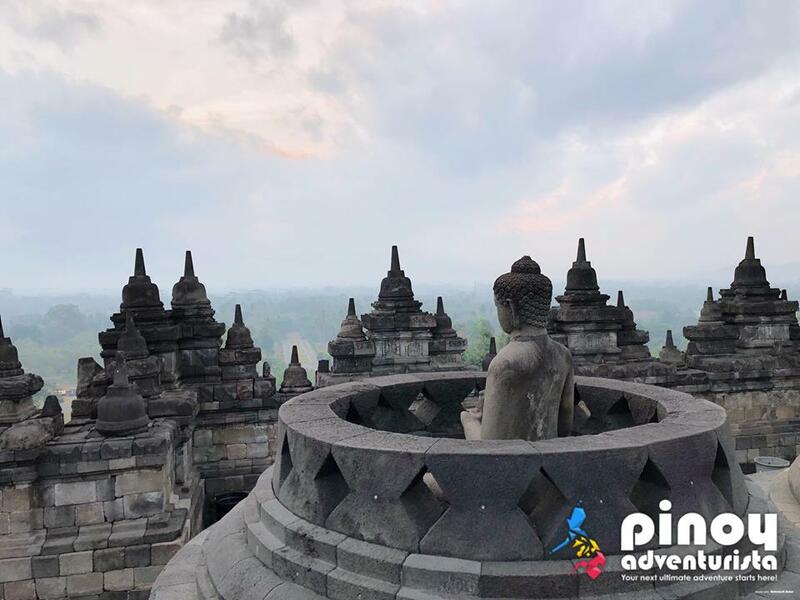 SUNRISE AT BOROBUDUR TEMPLE, "A UNESCO World Heritage Site and a Stunning Architectural Masterpiece"
Yogyakarta is a special administrative region in the island of Java in Indonesia and is considered as "the center of education and traditional Javanese arts." Pronounced as "Jogjakarta" or simply "Jogja" as the locals call it, was the Indonesian capital during the Indonesian National Revolution from 1945 to 1949. 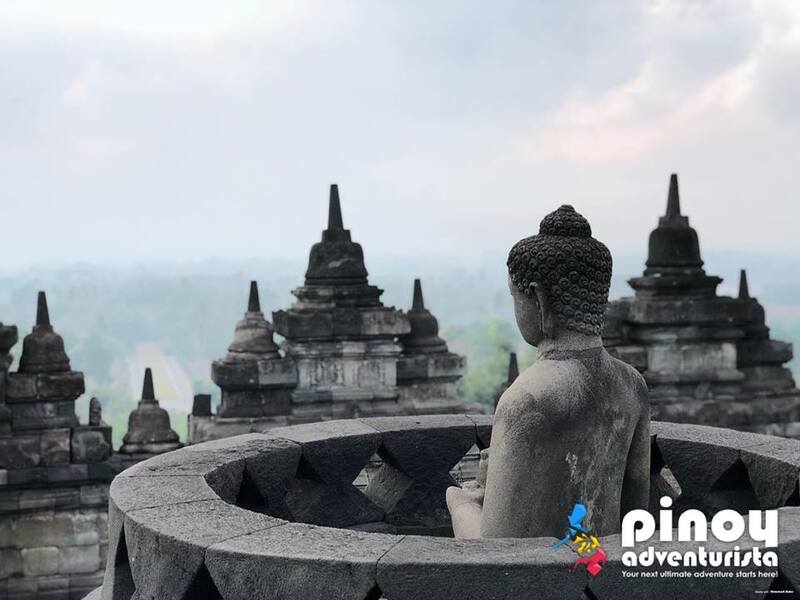 Because of its proximity to the Borobudur and Prambanan temples, it has become one of the top tourist destinations in Indonesia. 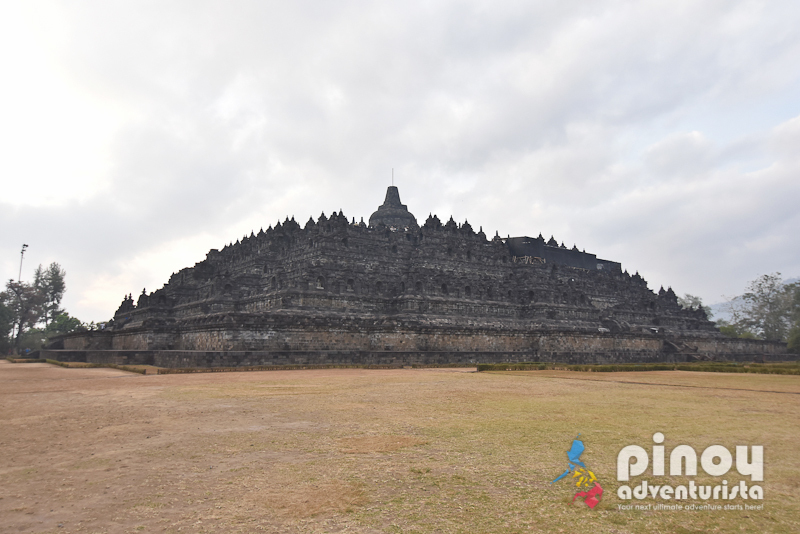 Recently, we went on a 3 days 2 nights trip to Yogyakarta, Indonesia. From Manila, we took a flight to Jakarta and then took a one-hour flight to Yogyakarta. Another option is to take a train or bus from Jakarta to Yogyakarta. These are the cheaper options but it takes about 8 to 11 hours of travel time, depending on the transportation you’re taking. So, to save on time, we decided to just take a plane from Jakarta. 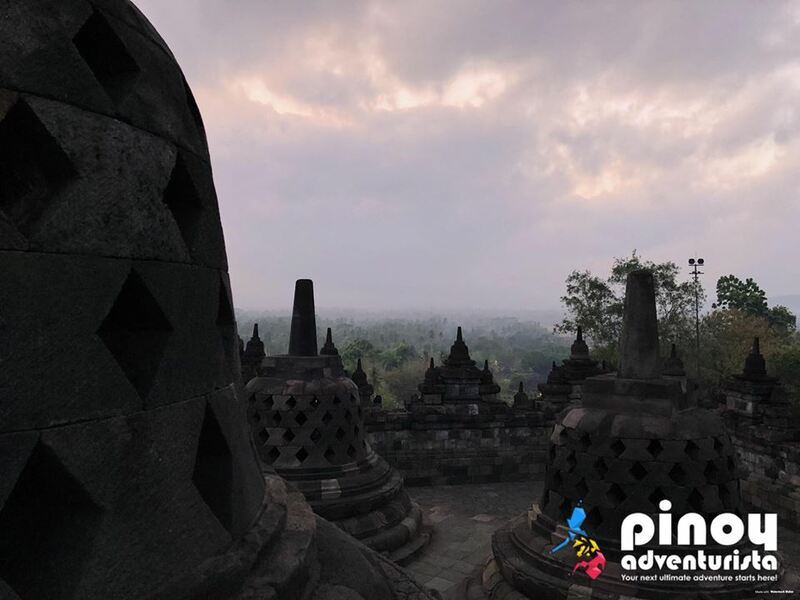 One of the main reasons of our visit to Yogyakarta is to experience the magical sunrise at Borobudur Temple. This 9th-century Mahayana Buddhist temple was built during the Sailendra Dynasty. 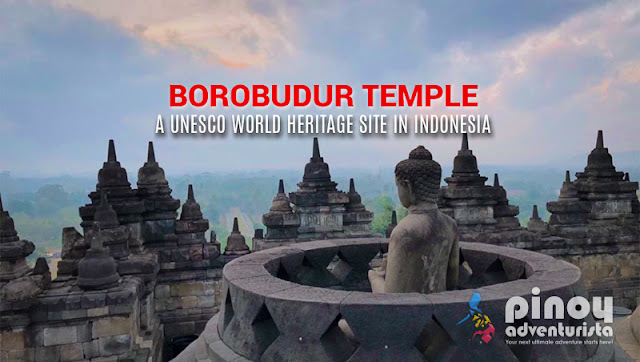 Located at about an hour away from Yogyakarta, it is part of the Borobudur Temple Compound which is a UNESCO World Heritage Site, and is said to be "the world's largest Buddhist temple." 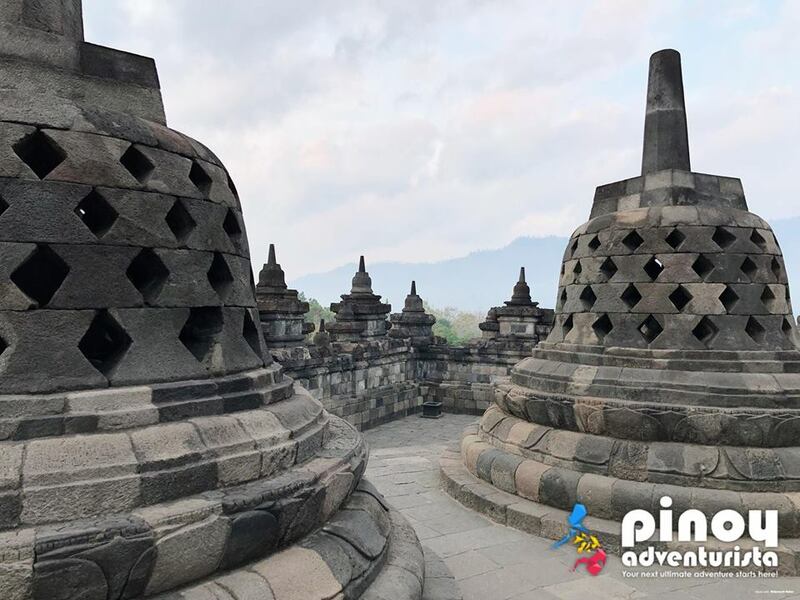 "The Borobudur Temple Compounds is one of the greatest Buddhist monuments in the world, and was built in the 8th and 9th centuries AD during the reign of the Syailendra Dynasty. 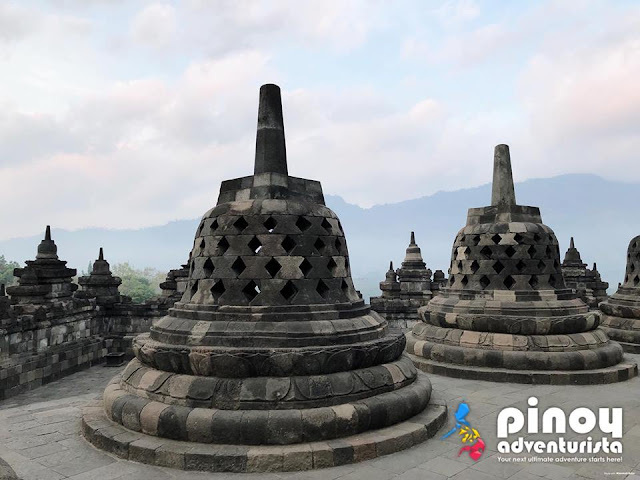 The monument is located in the Kedu Valley, in the southern part of Central Java, at the centre of the island of Java, Indonesia. The temple was used as a Buddhist temple from its construction until sometime between the 10th and 15th centuries when it was abandoned. Since its re-discovery in the 19th century and restoration in the 20th century, it has been brought back into a Buddhist archaeological site." To experience Borobudur Temple’s one-of-a-kind sunrise, you should arrive at the Borobudur Temple Complex at around around 4:30 to 5:00 AM. 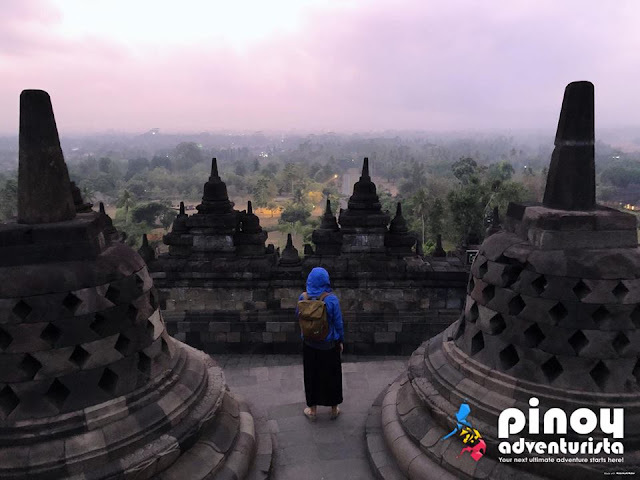 Since it is about an hour away from the City of Yogyakarta, we opted to avail a Borobudur Sunrise Tour from Klook.com - for ease and convenience. The tour package includes private transportation from Yogyakarta with hotel pick-up, entrance fee to the temple, use of flashlight, snacks/breakfast, Batik souvenir, transportation back to Yogyakarta, and hotel drop off. We were picked-up from our hotel at around 3:30 AM and arrived at Borobudur Temple Complex at around 4:30 AM. Upon arrival, our tour guide gave us our tickets and we proceeded to Mahonara Restaurant to register. Since it is still dark, they gave us a flashlight and directed us to the pathway going to the temple which is just about 5-10 minutes leisurely walk from Mahonara Restaurant. 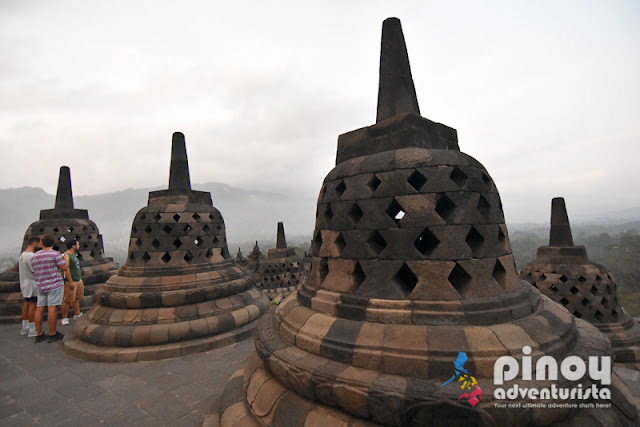 As many have said, a visit to the Borobudur Temple is not complete without a sunrise tour. That is why, we made sure that we experience it. When we reached the temple, we didn't appreciate how huge and massive it is because it was still dark. We just went with the flow and followed where people are going - to the top of the temple. To give you an idea, the temple has a base of 118 square meters and a height of 35 meters. It is composed of about 55,000 cubic meters of andesite stones and has 2,672 bas-relief panels and 504 Buddha statues. 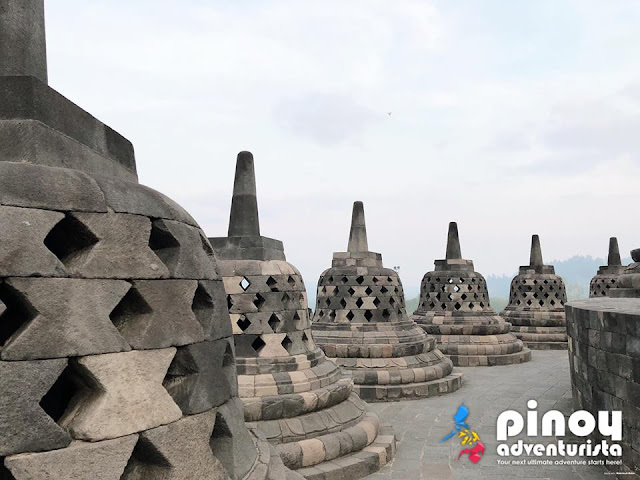 At a bird's eye view, the temple is in a shape of a traditional Buddhist mandala which is has a square base with four entry points and a circular center point. It was built according to Buddhist cosmology where the universe is divided into three major zones. The Borobudur represents these zones in its rising levels - the base level is the Kamadhatu (world of desire), the mid-level is the Rupadhatu (world of forms), and Arupadhatu which describes Nirvana and Sunyata worlds and is depicted by the three circular terraces on the top-most part of the temple. These three concentric terraces is where most of the tourists go to see the sunrise. 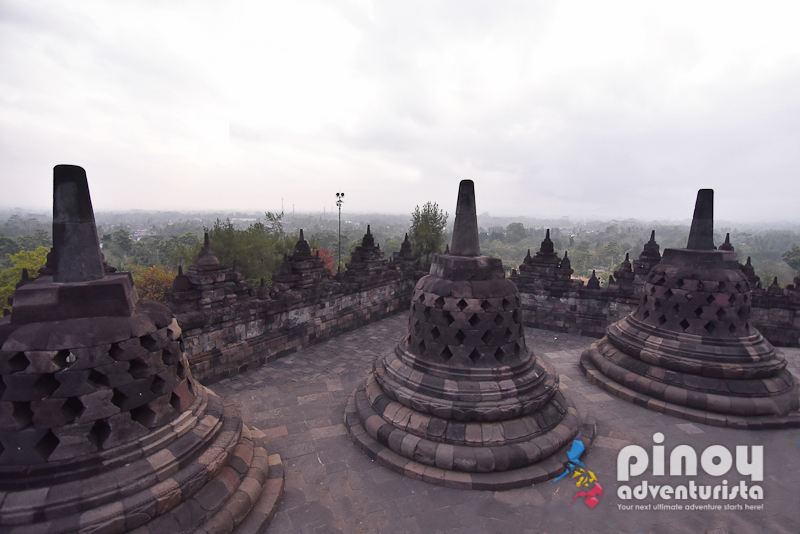 It is also where you could see 72 stupas each containing a statue of the Buddha and the main dome. Borobudur Temple is best experience at dawn, when the air is fresh, temperature is cool, and the sourroundings are full of mist against a panoramic scenery of mountains and terraces fields. We were so excited and patiently waited for the sunrise. 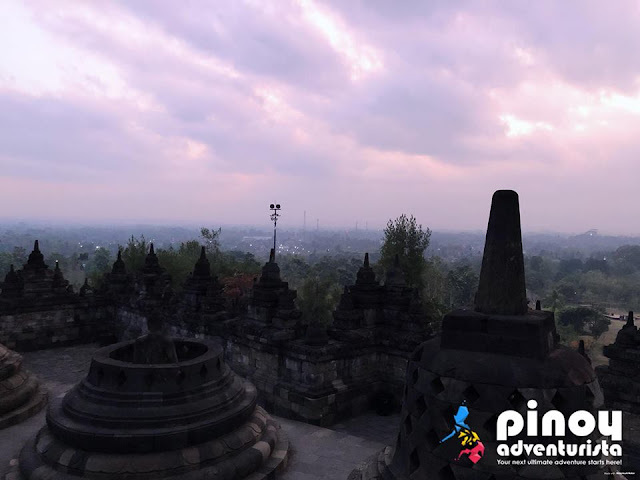 Unfortunately, it was so cloudy in Borobudur, and the beautiful sunrise is nowhere to be found. Hahaha! But still, it was an awesome experience! Don’t miss this when visiting Indonesia! For ease, comfort, and hassle-free Borobudur Sunrise Tour, and to save on travel expenses, I highly recommend that you book a join-in tour via Klook. It's an all-in tour package that includes transportation, entrance fees, souvenir, and breakfast. You can even request to visit nearby Pawon and Mendut Temples on your way back to Yogyakarta. 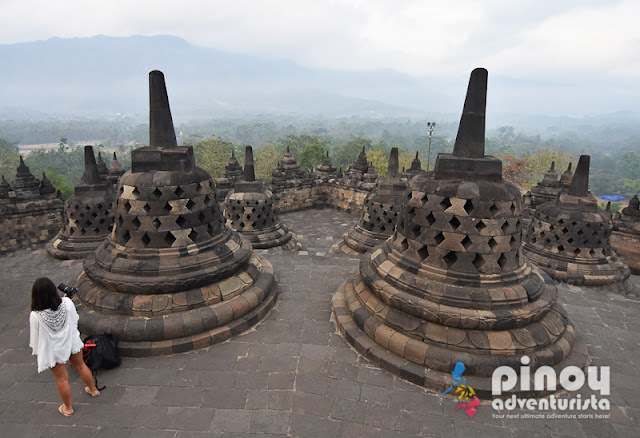 You may also visit Borobudur and Prambanan Temples in one day with a guided join-in or private tours. If you're too lazy to wake up very early in the morning, you can visit Borobudur during day time. Below are some options available for join-in group tours or private tours from Yogyakarta. 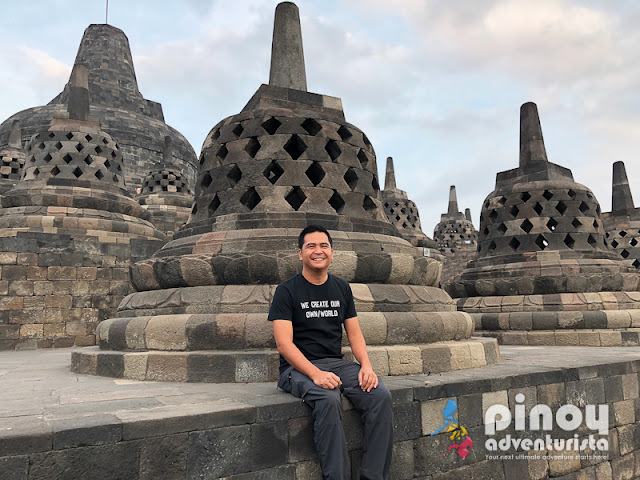 How to get to Yogyakarta Indonesia? There are no direct flights from Manila to Yogyakata Indonesia. From Manila, you can take a plane to Jakarta or Bali and then take another flight to Yogyakarta. Another option is to take a train or bus from Jakarta. Trains from Jakarta depart from Pasar Senen Station or Gambir Station. 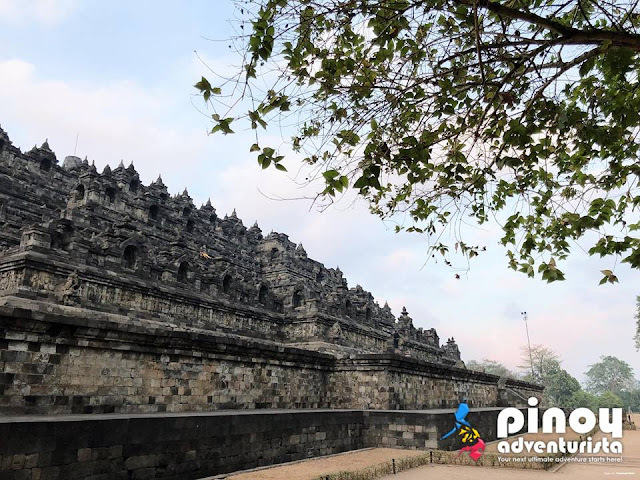 Travel time from Jakarta is about 8 hours and arrives in Yogyakarta in either Lempuyangan Station or Tugu Station depending on the type of train you take. By bus, there are several bus companies that offer Jakarta to Yogyakarta routes. Travel time is around 11 to 12 hours. To search for cheap flights to Jakarta, I highly recommend booking via Traveloka.com - one of Southeast Asia's leading travel booking sites.